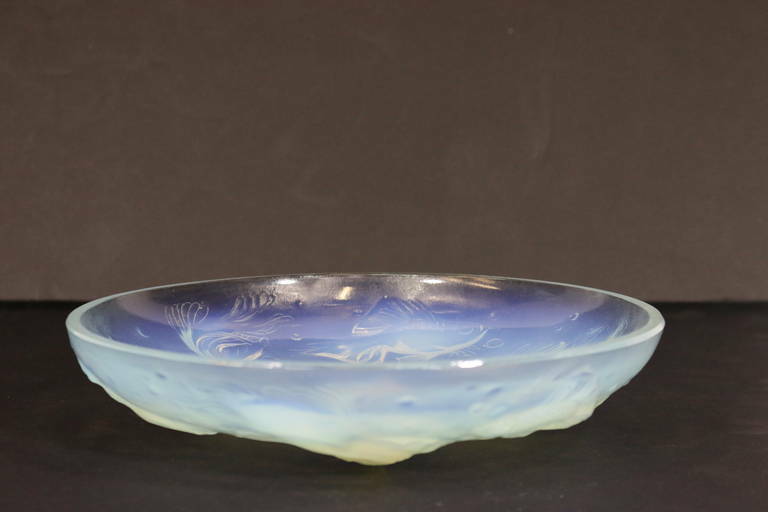 20th century design, a beautiful large opalescent frosted glass bowl with fish in high relief swimming in a circular formation around bowl. Stamped "Sabino," France, circa 1960 10” diameter. 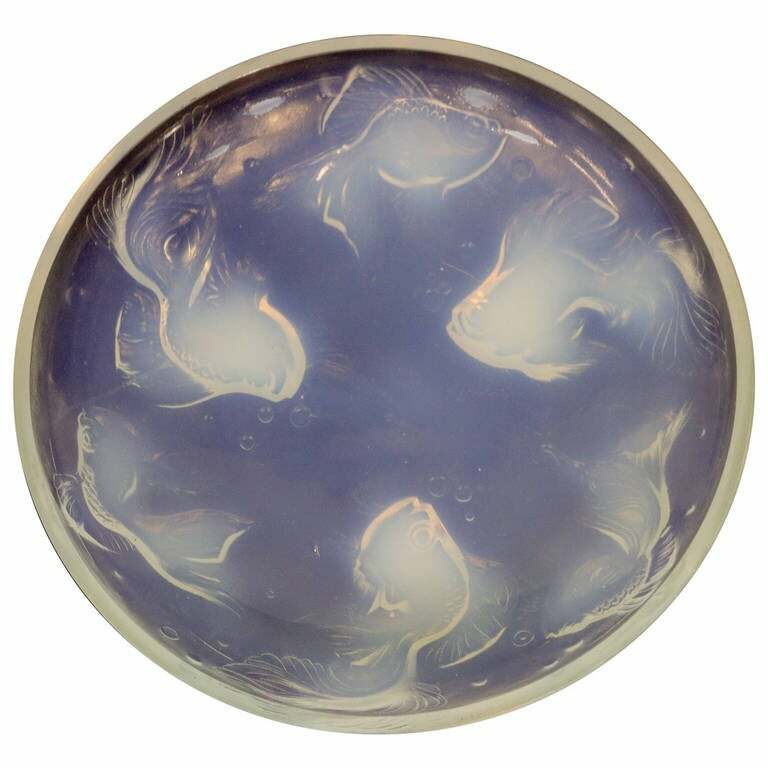 In the taste and style of the Similar R. Lalique Plate which sells for up to $10,000. 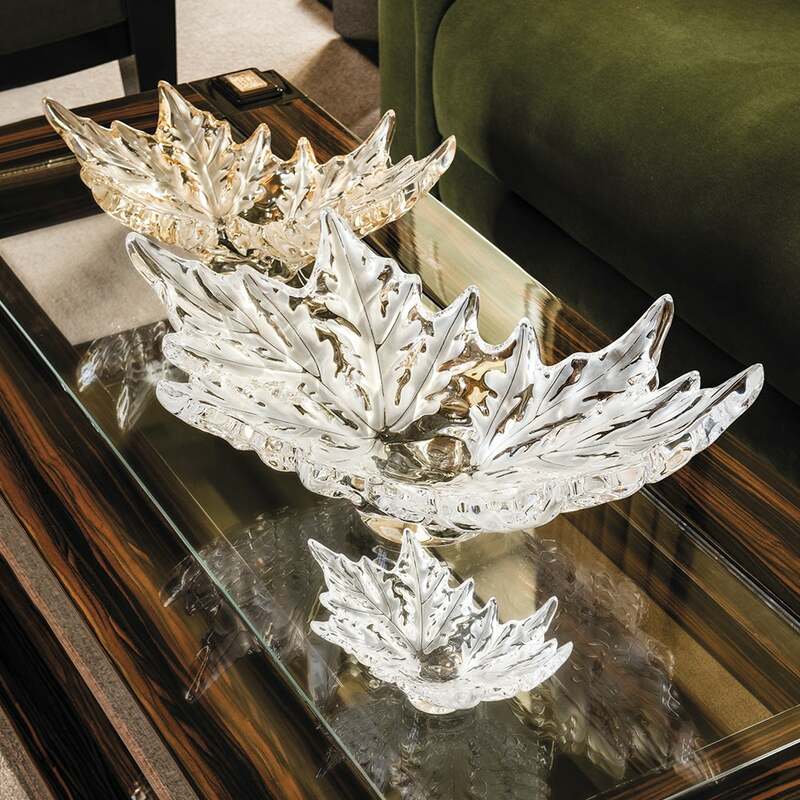 Serve in style, or show off as a centerpiece or as a decorative charger in a stand. It will be an admired object!! Provenance: Assembled from our family's Maryland estate, The Edith Hale Harkness estate. The Harkness Family was among 19th century America's first philanthropic society families as financiers to Rockefeller & Flagler for Standard Oil. Share the legacy! 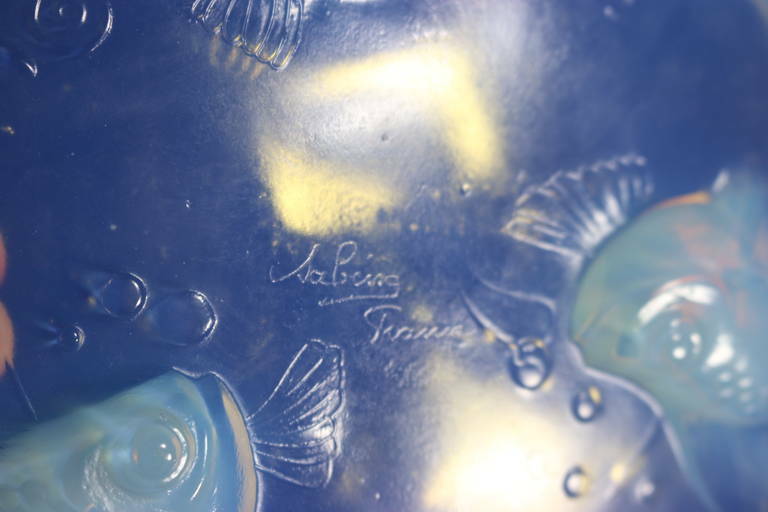 Sabino art glass refers to the opalescent vessels, figurines and lighting fixtures that Marius-Ernest Sabino produced in the 1920s and ’30s and that epitomized the cosmopolitan glamour of Art Deco. 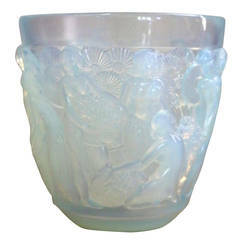 Along with René Lalique and Emile Gallé, Sabino was part of a robust tradition of French creators of art glass that became a signature of Art Nouveau at the turn of the 20th century and who then pivoted to embrace the geometric style of Art Deco. Sabino was born in Sicily in 1878, moving with his family in the 1880s to France. There his father was a sculptor working primarily in wood. Encouraged by his father to study fine art, Sabino attended both the École national supérieure des Arts Décoratifs and the École national supérieure des Beaux Arts de Paris. During his studies, he became fascinated by the new technologies for generating electricity and how they were changing the glass industry. Returning home following service in World War I, Sabino founded a factory that manufactured light fixtures in wood and bronze, but he quickly switched his focus to glass, as his experiments with the material yielded novel results. 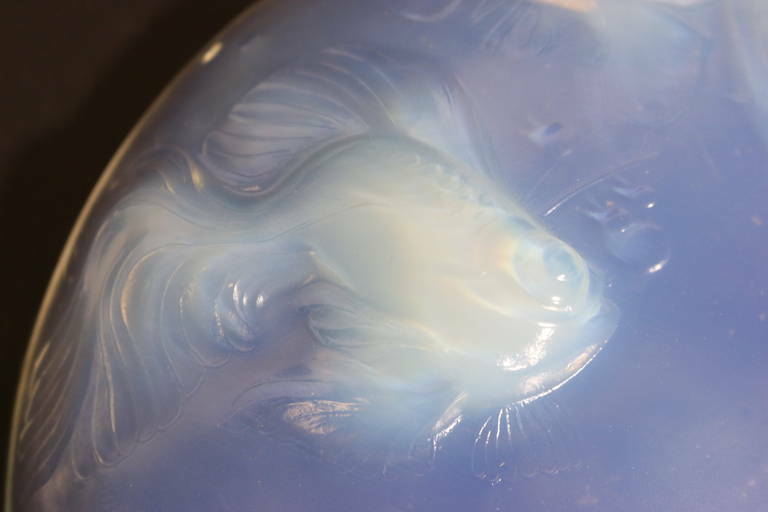 By 1925, he had developed an opalescent glass with the iridescence of soap bubbles or peacock feathers. 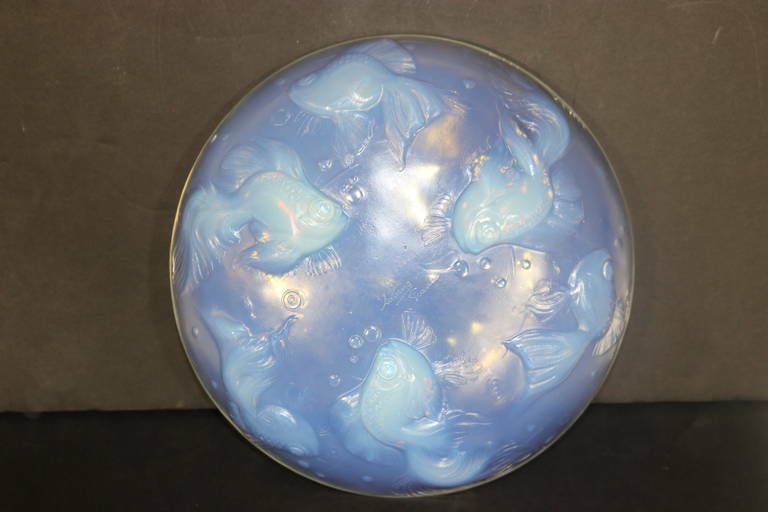 During the Great Depression, despite the era’s economic turbulence, Sabino’s designs for light fixtures, vases and figurines were in high demand. Among his sculptural pieces are large fish figurines, created in a limited edition in 1931, two of which were acquired by Maurice Chevalier and Josephine Baker. Like French fashion, graphic and interior design during the interwar period, Sabino chandeliers remain eternally chic. Many of his custom pieces are huge, such as the ones he created for the SS Île de France, in 1927, and for the Grand Salon of the SS Normandie, in 1935. No matter the size, however, one of their hallmarks is that the glass components are central to the overall design, rather than being merely ornamental. 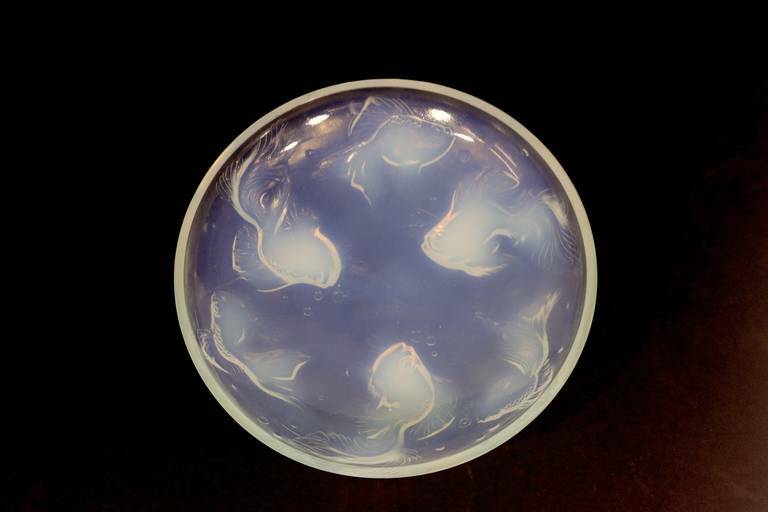 This quintessentially Art Deco molded-glass fixture, with its geometric form and floral pattern, perfectly captures the mix of subtlety and originality that characterizes the best examples of Sabino art glass.